A Federal High Court in Abuja heard Wednesday how the wife of former Chief of Air Staff (COAS), Alex Badeh and his two sons escaped to the United States on learning that they were being investigated in relation to alleged fraud involving Badeh. A prosecution witness, Abubakar Madaki, who testified at Wednesday’s proceedings in the Bdeh’s trial gave details of how the allegations against Badeh was investigated. Madaki, an investigator with the Economic and Financial Crimes Commission (EFCC) was led in evidence by lead prosecuting lawyer, Rotimi Jacobs (SAN) as the prosecution’s 18th witness. He gave Badeh’s wife’s name as Mary and his two sons as Alex Badeh (Jr) and Kam. He said his team of investigators was able to link some properties allegedly bought by Badeh through proxies to him from the movement of funds from the Nigerian Air Force’s account to the sellers. The witness said, “As of today, the subsequent buyers have not registered their interests. “Since the subsequent buyers have not registered their interests, as I earlier stated, we got the occupants of the property and those working on the projects, who took us to the final owners of the properties, because the properties have gone to three owners from the original owners. He said Badeh’s wife and two of his children were being investigated for offences with which the ex-Chief of Air Staff, was charged. He said the three of them, however, escaped to the United States of America before investigation was concluded. He said, “At the initial stage, when we started investigation, we invited Alex Badeh (Jnr.) (Badeh’s son) who lives in 19 Kumasi Crescent, Abuja, one of the properties, among the properties earlier mentioned. “He happened to be a son of the first defendant (Badeh). He claimed to be a tenant in that property and since investigation was ongoing at the preliminary stage, we allowed him to go to come back when we had enough issues to question him about. “She too, according to investigation has left the country for America. “Kam Badeh (another of Badeh’s son) is one of the directors in one of the companies. “Since the information was that they left through the International Airport, we wrote a letter to the Nigerian Immigration Service and the Department of Security Service to watch-list them. “But We have not been able to get them,” the witness said. He added “The first defendant was Chief of Air Staff and subsequently the Chief of Defence of Staff. Funds from the Nigerian Air Force were being diverted to the second defendant (Iyalikam). “We also discovered that N558,200,000 was being set aside for the first defendant from the NAF account. “Part of the funds were being exchanged into dollars and handed over to the first defendant. Some fractions of the funds were being distributed as directed by the first defendant. “The major part of the funds was exchanged into dollars and was used to acquire choice properties in Abuja by the director of finance, Salisu Yishau. The witness als gave details about how a cash sum of $1m was found in Badeh’s residence at 6, Ogun River, Off Danube Crescent. “The property was purchased by the defendants with the funds we are investigating. “We found in the course of searching the premises $1m which was believed to be part of the alleged funds we are investigating. He also said $900,000, allegedly part of the diverted NAF’s funds, was deposited in Badeh’s accounts with the First Bank between 2012 and 2013. At a point, the prosecuting lawyer, Jacobs sought the court’s permission to play a video recording of how the EFCC allegedly recovered $1m a property said to be owned Badeh in Abuja. When the court granted his request, Jacobs said he would bring another witness through whom he would play the video recording. During cross-examination by Badeh’s lawyer, Lasun Sanusi (SAN), the witness admitted that he (Madaki) did not personally participate in the purchase of the properties under investigation. On how funds allegedly diverted from NAF’s account were changed to dollars and eventually ended up in Badeh’s hand, he said the his team got to know about it during investigation. Earlier, in a ruling, Justice Okon Abang admitted as exhibits title documents of a N650m Abuja property sold by Governor Ayodele Fayose of Ekiti State to buyers from who Badeh allegedly bought the property, suing a proxy. Justice Abang admitted the documents as exhibits after dismissing Badeh’s objection to their admission. Badeh and his firm, Iyalikam Nigeria Limited are being prosecuted by the Economic and Financial Crimes Commission (EFCC) on a 10-count charge of money laundering, in which they were accused of fraudulently removing about N3.97bn from the account of the Nigerian Air Force. 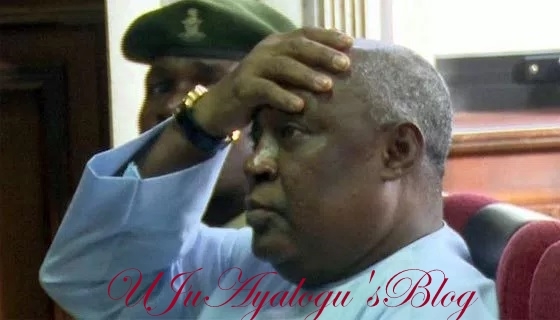 They are also accused of using the money to buy and develop landed properties in Abuja for Badeh and two sons between January and December 2013. The documents admitted by the court’s ruling yesterday include the deeds of assignment between Fayose and Tony O. Ezekiel dated December 12, 2009, and the Certificate of Occupancy bearing the governor’s name. Other documents admitted as exhibits included a letter dated March 4, 2016 with attachment sent by the Lands Department of the Federal Capital Territory Administration in response to EFCC’s request; a reply dated May 5, 2016 by the Abuja Geographic Information; letter by the Solicitor-General of the Federation and Permanent Secretary of the Federal Ministry of Justice. The prosecution’s 4th witness, Mustapha Yerima, who testified on May 23, 2016, Mustapha told the court how a plot of land in Abuja worth N650m and which was originally owned by Fayose was purchased by Badeh for the construction of a shopping mall at a cost of N1.2bn. Yerima, a contractor and Managing Director of Life Builders Technology Limited, Said the shopping mall is located along Amino Kano Crescent, in Abuja. He said Badeh eventually acquired the land from the third buyer. Yerima said he reached a bargain with Badeh to build the mall for N1.2bn. He said that a former Director of Finance and Account of the Nigerian Air Force, Air Commodore Aliyu Yishau (retd), who had earlier tes‎tified as the first prosecution witness (PW1), was the middle man between him and Badeh. The trial resumes on November 1.